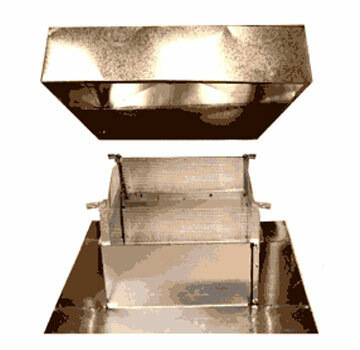 PRODUCT: Box Roof Vent, 18 x 18 inch ID, 29 x 29 Top, 30 x 30 Base, 6 inch Clear Rise Under Top, Removeable Top. 26 Gauge Galvanized Steel. 247 Sq.In. Net Free Vent Area. Price/Each. VENT AREA: 247 sq.in. net free area. TOP CLEARANCE FROM BASE: 6"
PACKAGING: 20 units / pallet. 48x48x72"
APPLICATIONS: 2-Piece design comes pre-assembled. 4 screws allow removal of entire top to provide access to roof line. Foam and insulated roofs. Flat Top Roof Vents / Vent Caps are economical stationary roof ventilators designed for general relief and intake applications. CONSTRUCTION: Galvanized 26 Gauge steel, spot welded for strength & durability, caulked for assurance against leakage. #4 mesh hardware cloth meets FHA requirements for protection against bird & insect passage.